The following excerpt is taken from the upcoming second volume of the Din Eidyn Corpus. IFYOU HAVE NOT READ dEaDINBURGH: BOOK 1 DO NOT READ ON. Din Eidyn Corpus Book 2 Will follow Alys and Joey directly after the events of book one, but will also show awider look at the outside world, beyond the dead city’s fences. As well as continuing Fraser Donnelly’s story, we’ll also see Michelle MacLeod (Joey’s mother) before she entered the dead city and discover how she came to be in amongst the dead. Voiding the light breaking through the gap in his curtains, Jack squinted at his Holo-Screen, blinking the fog from his eyes. Seven a.m.
He’d been playing the dEaDINBURGH: Lair of The Ringed video game since midnight. Since the feed had been cut from the live show. He flicked his finger across the air in front of him, causing the UKBC screen to pop up. The countdown until the feed re-connected sat at 00:15. Just fifteen more minutes until they had the show back onscreen in full High-Def Holo-Image. Jack saved his progress and kicked at the desk in front of him, sending his ergonomic chair scooting backwards through the pile of empty energy drink cans and takeaway boxes littered across the carpet of his living room. Scratching at his crotch with his right hand, he lifted his left arm and sniffed at his arm-pit, screwing his face up at the sourness. Should have time for a shower if I get a move on. Jack stood with a groan in protest at the crack of his knees. It’d been a while since he’d had quite so long a session on the game. Scooping a handful of Cheesey-Puffs off of the desk and into his mouth he headed to the apartment’s little shower cube. As he sang from the shower, the dEaDINBURGH theme began blasting from the surround sound speakers, eliciting a whoop of delight from him as he barrelled from the bathroom, not bothering to dry himself, body wobbling back into his still-warm chair. Leaning forward he made a little gesture, enlarging the screen and scanned the info-bar along the bottom of the page to catch any updates. There were too many to read so Jack flicked at finger at the Holo-Screen, bringing up a highlights reel on a smaller screen within the main one. Whilst the main screen flickered into life, he flicked his eyes from the main image to the highlights feed, gleaning everything he could about what had happened to his favourite Survivors during the feed-loss. Suzy-Wheels, Danny McGhee and Jennifer Shephard, his main characters, all were more or less where they’d been when the feed had cut twelve hours earlier. Jack flicked at the screen a few more times, bringing up images of one of the less popular and least-covered Survivors he’d been following. Joey MacLeod’s face filled the frame. Jack liked this kid. He’d begun to get a little more airtime recently, mostly because he’d been in a few scraps with The Ringed of late. Jack remembered him from the episodes where he’d left The Brotherhood a few years back, with the old Padre. Padre Jock had been a favourite of Jack’s as a kid. As a Zom-Hunter and one of the most colourful characters on the show, he’d had a huge chunk of airtime over the years and had consistently been in the top-ten Survivors chart for over twenty years. When he’d been killed by Bracha, Jack had shed a few tears for the old man who seemed as intricately tied to the show as its theme tune to a generation who’d grown up watching him. Three years later, Jack still felt grief whenever he looked at one of the many images of Jock on mugs, posters, T-shirts and other merchandise around his home. Jack had a massive poster of Jock over his bed, a scene from the show, showing a young Jock, blades flashing, Silencing five Zombies. It bore the legend: Running rings around The Ringed. One of Jack’s online friends had a tattoo in the shape of the characteristic Ring o’ Roses rash of The Ringed. Many of Jock’s fans had now latched onto the eighteen year old the old preacher had trained out of the need for a connection to the familiarity of the Padre. Aside from that, they’d grown to know and love Joey during his time with Padre Jock. The screen showed Joey and Alys, both shot from behind, in a large open field. Joey had his bow over his back and was following along behind Jennifer’s daughter. They looked tired and were both covered in a grey dust. Jack watched as the cameras zoomed out, revealing a mass of Zoms spilling out into the field from a cycle path and a little clearing in a woodland. From the trail in the long grass, it was obvious that the teens had come from the Zom-infested area. It was a beautiful shot, so much so that it moved Jack to click the little thumbs-up icon at the corner of the screen. He was only the hundredth to do so. It made him feel a part of something special, that he was amongst the first to see the beauty in the photography. Wondering how the teens had survived the massive congregation of Zoms and why the infected weren’t pursuing them, he whirled the highlights footage over to the main screen and began searching through it, hoping that he hadn’t missed something special. He looked at the view counter at the edge of the highlights screen. One View. A single viewer besides him. Jack felt a thrill surge through him and clicked the thumbs-up icon, making himself the second person to have done so. As the images moved he watched amazed as Joey and Alys moved like crowd-surfers along a mass of the dead. They seemed completely calm, so at ease. Jack he’d never seen anything like it. Nobody had. As the scene progressed, it was suddenly cut with footage from earlier in the day. They had battled hundreds of the dead in that same clearing, Joey in a tree firing arrows and Alys a demon with her twin Sai. It was astounding and contrasted so sharply with the serenity of the previous footage that Jack felt a prickle all over his skin. He watched Joey and Alys’ Survivor ratings rocket from the around 10,000 straight to position two and one, respectively. Realisation suddenly made him jerk in his seat. He motioned at the screen and watched as his viewer rating appeared. Last night he’d been in the upper ten-million region. A respectable position for someone in Kent. The total viewing figures worldwide for dEaDINBURGH were at around four billion. Due to his early support for Joey, and lifelong support of Jock, he’d voted and thumbed-up Jock hundreds of times, maybe thousands in his lifetime, Jack’s Viewer Rating would receive a boost. Factor in his support of Alys by proxy of being a Jennifer Shephard supporter and combined with this morning’s early acknowledgement of both the live-feed and the highlights package, and Jack’s viewer rating should be at an all-time high, perhaps top one million. Jack blinked in disbelief as he looked at the numbers. His rating had been propelled to top 500, worldwide. Number 1 in Europe. His Holo-Screen suddenly lit up with emails, messages and invitations regarding interviews, expert analysis, insights. He was being lined up for a series of appearances across some of the biggest shows on the network and a clutch of major blogs and newsfeeds. Messages of congratulations from his network-family scrolled across his screen. In one minute he’d gone from being another nobody, an above-average fan who spent a little too much time watching the most-watched Holo-programme on the planet, one of those guys who haunted the thousands of fan-sites and pages looking for insights and extra-footage, to the hottest viewer-consultant in Europe. He’d always known that he was someone special. Always felt that he was destined for something better than his current station in life. Something that made him worthy of the name he carried. This was it. Finally. Jack Thatcher glanced down quickly at his mostly-naked, wet body, edges of the towel barely meeting around and under his belly. He gave a curt, decisive nod, to himself. Time to get sorted. The first thing I’ll do is get that liposuction and a skin removal. And my teeth. Get my teeth fixed. With the kudos and the money that’d be coming his way, it was time to get himself together. Rising from his seat, he stopped for a second, lifted his right thigh a little and expelled a cloud of gas before heading to his wardrobe. Drying off, he sniffed at then pulled on a pair of reasonably clean sweatpants, figuring that he’d aim the Holo-Camera from the waist up. Best to be comfortable. Jack then pulled on an old dEaDINBURGH T-shirt his dad had given him on his thirtieth birthday, with an image of Jock in full Plague-Doctor outfit on the front. It felt a little tight, but familiar. Striding back through to take his seat, he flicked open the Comm for his first interview with an American news network, allowing himself to enjoy a moment of satisfaction at finding his rightful place. He smiled warmly and connected his call. 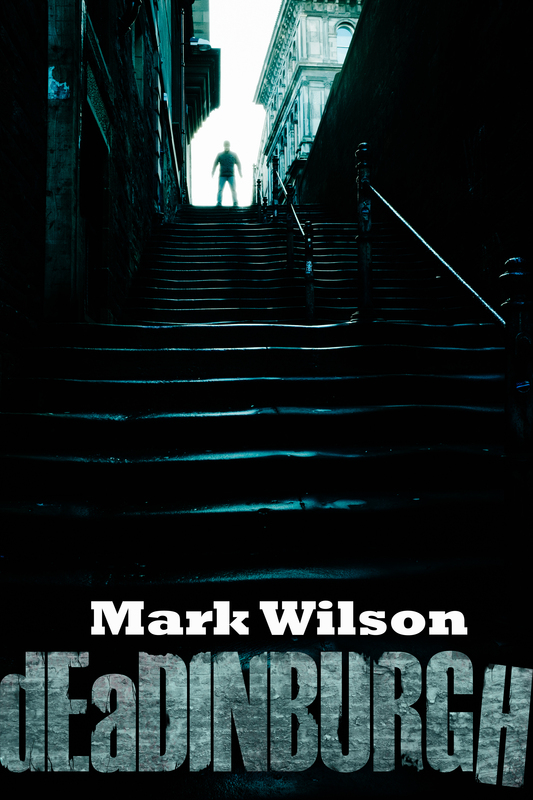 dEaDINBURGH (Din Eidyn Corpus) Book: 1 (and Mark’s Lanarkshire Strays collection) are available now as a paperback and on kindle at Amazon, US and Amazon, UK.